Please excuse my singing, but while just a few days I thought I was an elf in Santa's workshop, today I can't help feeling like Julie Andrews in The Sound of Music; I have 28 beautiful little bundles of stationery going in the mail this afternoon!!!! Isn't it time to get yours? OMG -- these are so cute! Looks like you have been super busy! I need to order a set of these for my goddaughter... too fun! You are too cute! 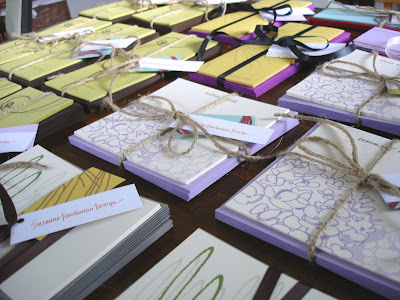 Your little paper packages look sooo goood! p.p.s. and i have high speed internet now...man it feels good. As someone who received her package of treats-to-self last week, I second the motion that these are very pretty little bundles.